Carefully analyze the worksheet to make sure it is appropriate for your students - modify as appropriate. The worksheet will likely need scaffolding for younger students and higher level questions for older students. Younger students may require pre-teaching to calculate the percentages of CO2 emission. This activity could be used as an introduction to the Lifestyle Project http://serc.carleton.edu/introgeo/enviroprojects/lifestyle.html (also part of the CLEAN collection). 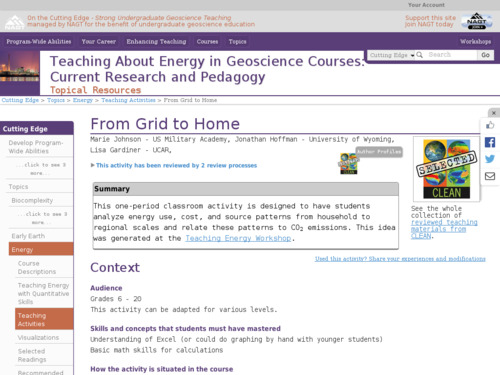 Links are given to find and use additional data about the source of energy in the individual region. As this information will change over time, seek up-to-date data as needed. Comments from expert scientist: All of the sources are credible and provide up to date information. Because every student might not be able to bring their energy bill, it would be useful to use the teacher's bill, or have example bills from different regions. Activity can be done individually or in small groups, possibly as a homework assignment. Opportunity for students to share results. All necessary materials available, including data.